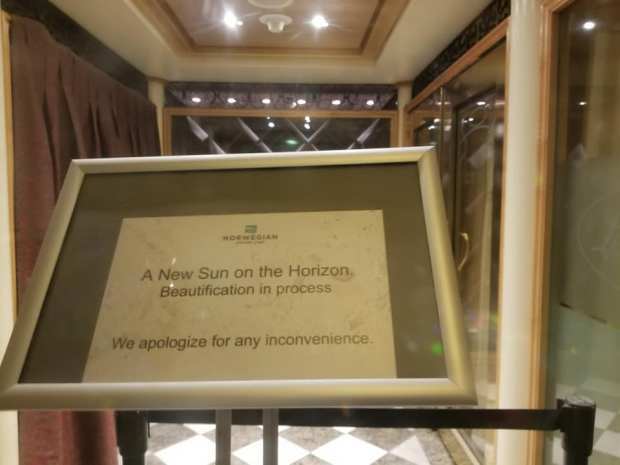 After passengers shared photos and videos of construction on their cruise ship during a recent trip, Norwegian Cruise Line said in a statement that it tried to "minimize" the impact of the ongoing projects and issued an apology. Passengers aboard a cruise ship that left Miami for Los Angeles last month on a 15-day journey are sharing photos and videos of their vacation memories -- few of which are the kind to cherish. 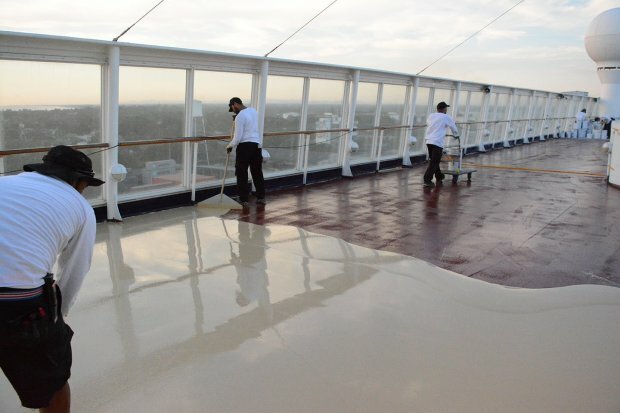 Photos from aboard Norwegian Cruise Line's Sun show what passengers described as a floating construction zone with blocked off areas, tools and construction equipment on the ship's deck, pallets stacked with chemicals and exposed supplies, dust and debris. Some of the videos captured the jarring sounds of hammering, grinding, sanding and other construction noises. Passengers aboard the Norwegian Sun shared photos of work on the cruise ship during a March 2018 journey from Miami to Los Angeles. "From the moment we stepped on-board to when we waited to disembark, the Norwegian Sun was under massive construction," passenger Casey Bennem posted in a Facebook group created to share Norwegian Sun experiences. The Sun left Miami March 16 bound for LA via the Panama Canal. Passengers said they were not informed of the construction prior to boarding, when they noticed some of the ship's areas were closed off. Signs at some of those areas indicated the ship was undergoing improvements. Some passengers said they received a letter in their cabins about the work, passenger Keith Roos, of Atlanta, told NBC News. Frustrated passengers expressed concerns about their health and safety, he added. In a statement, the cruise line said it tried to "minimize" the impact of the projects and issued an apology. Passengers aboard a Norwegian Sun cruise encountered blocked off areas aboard the ship during a March 2018 journey from Miami to Los Angeles. "At Norwegian Cruise Line, the travel experience, safety and satisfaction of our guests is of the utmost importance to us," the company's statement said. "Recently Norwegian Sun underwent enhancements as part of our continuous efforts to ensure that every ship across the fleet delivers a consistently high-quality passenger experience. While we do our utmost to minimize any impact to our guests when these enhancements are being implemented, we do recognize that during a recent sailing, we did not meet the expectations of our guests, nor our own standards, for which we truly apologize." Guests aboard the March 16 cruise were offered a 100-percent future cruise credit of their paid fare that can be applied to another cruise through March 2023. It was not immediately clear whether passengers had been informed of the cruise line's credit offer. "We realize that this gesture cannot replace their recent experience but do hope to have the opportunity to welcome them on board again soon," the statement continued.